a knee 'resurfacing' because only the surfaces of the bones are actually replaced." Two down, one to go. Knee replacement surgeries, that is. After Jim and I both had to stop running several years ago, we used to joke that we had only one good knee between us. It was one of Jim's knees. He'd already wrecked his other one. Several years ago he had a nasty bike accident and damaged the meniscus in one knee. Surgery to repair the meniscus wasn't successful enough to allow him to resume running. Before long, the cartilage wore down enough in one compartment of the knee that it was painful for him to walk. So last December he had a partial knee replacement to fix it. Meanwhile, previous to that I had already learned back in 2009 that I was at or near being "bone-on-bone" in both knees due to osteo-arthritis, the most common form of arthritis as we age and our cartilage wears out. I began getting viscous gel injections every six to eight months in both of my knees, a treatment called visco-supplementation. The brand I used most often was Orthovisc, given once a week in both knees for three weeks by my orthopedist in Roanoke, VA. While traveling around the continent in our RV the last 13 years, other orthopedists occasionally gave me Synvisc, GelOne, or Hyalgan if we weren't in Virginia when I needed more injections. There are other brands of gel, too. I was lucky those injections worked very well to relieve all or most of my knee pain for about six years. Then rather suddenly the gel reabsorbed faster than six months. That's the minimum length of time between injections that insurance companies and Medicare will pay for these expensive treatments. For the last two years I got an interim cortisone (steroid) injection between gel injections to keep the pain at bay. Then rather suddenly this summer that didn't work either. The cortisone didn't last more than a few weeks and it wasn't safe to get more until three months had elapsed. My knees hurt so badly I couldn't walk for exercise, even if I took a Tramadol pill (a rather mild opioid pain reliever), let alone with the generic ibuprofen or acetaminophen I'd been using for many years. That's when I knew all of my non-operative treatment options had run out and I'd need two total knee replacements. Fortunately, I knew who to call! This could have been very time-consuming since we've recently moved to a new area. I totally lucked out without even trying -- and before I even knew I needed a knee replacement surgeon yet! One of the first neighbors we met when we moved to Peachtree City at the end of March is a retired couple living in the house three doors down the street from us. They were walking by our house one morning and saw the Leadville 100 shirt I was wearing. Their son, who was visiting from N. Georgia, recognized this popular endurance cycling and running race; he's a runner. When I mentioned that I don't run any more and would probably need knee replacements in another year or two, Gail quickly said she had a wonderful orthopedic surgeon who did one of her knees three years ago, Dr. Todd Schmidt with Ortho Atlanta. She highly recommended him for his extra-minimally-invasive surgery technique that allowed her to recover faster than the average patient. Dr. Schmidt is reportedly one of only 15% of orthopedic knee surgeons who use a more time-consuming and difficult procedure to spare as many nerves, muscles, tendons, and ligaments as possible. 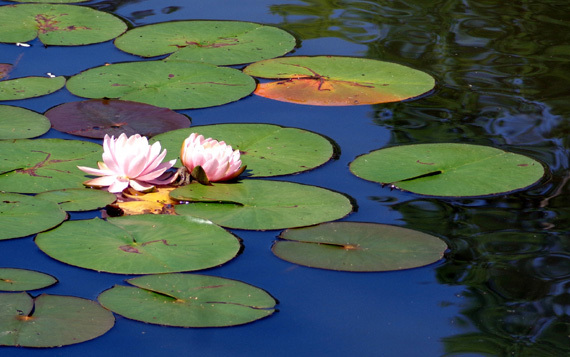 Gail is physically active, which also helped her recover more quickly. I made an appointment to see Dr. Schmidt in early June to get interim cortisone injections in both knees; my insurance wouldn't pay for more Orthovisc or Synvisc gel until September. At that point I assumed the cortisone would last until September -- it had lasted three months previously. I knew the hand-writing was on the wall, however, so I asked him -- as I've asked other orthopedists I've visited in recent years while traveling around the country -- how I'd know when it was time for a total knee replacement. I already knew I was bone-on-bone in two compartments in both knees so I wasn't a candidate for a partial knee replacement like Jim had. I also knew I wanted to be in good physical shape when I had surgery, which meant doing it before my knees hurt so badly that I couldn't walk or cycle enough to be fit. A fit patient always does better during and after surgery than an unfit one. Dr. Schmidt basically said I'd know when I needed knee surgery! He explained that when my quality of life was compromised, when I could no longer walk, cycle, and participate in other activities like I wanted, it was time for surgery. In no way did he push for surgery, even though he's done thousands of total knee replacements during his career and plans to do a bunch more. He encouraged me to wait until more conservative treatments like the gels and cortisone no longer worked but said the damage to my knees was already advanced enough to justify surgery if I decided to have it done. My knees soon felt better with the cortisone and I was able to comfortably walk, cycle, do gardening chores, etc. I knew I'd probably need knee replacements in the next year or two, though. I was pretty surprised when both knees began hurting five or six weeks after that. Gels and cortisone were no longer the answer, nor the other conservative treatments I'd used before that like physical therapy, reducing the miles I ran and cycled, and taking OTC pain meds. Rather suddenly I knew it was time! I called the doctor's surgery scheduler, got a date for surgery about six weeks later, and prepared myself mentally and otherwise for the first of two total knee replacements. It really helped me to have a positive attitude about surgery because I'd been involved in the whole process last winter with Jim. There were some differences, of course, because he had a partial and not total knee replacement but they are similar invasive procedures. In addition, we were spending the winter in SE Georgia then. His doctor and hospital were in Brunswick, his physical therapist in St. Marys. I'd be having my surgery in metro Atlanta with a different doctor and hospital. Each doctor, hospital, and PT does things a little differently but there were enough similarities that I almost felt like I'd been there, done that. That experience as a wife and recovery "coach" were valuable when I became the patient. Another reason I was ready to make the decision to have surgery is that just about everyone I've ever talked to who has had one or two knee replacements has said they only wish they'd had surgery sooner because they were able to resume doing the things they wanted to do -- after full recovery -- without pain. I haven't known anyone in recent years who regretted having the surgery and very few people said they had such a bad experience that they decided against having their second knee done, if it needed fixing. I also heard more kudos as I was awaiting surgery from new friends and medical providers in this area re: Dr. Schmidt's expertise. Having faith in your doctor is very helpful through the whole process. WHAT EXACTLY IS A TOTAL KNEE REPLACEMENT? This is the lay term for the surgery that involves replacing a seriously arthritic or otherwise damaged knee with an artificial joint made of metal and plastic. The correct medical term is "total knee arthroscopy," or TKA. 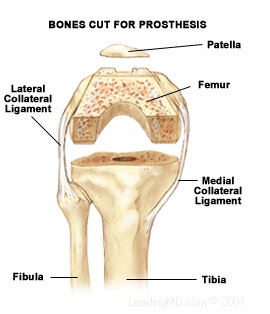 The surgeon removes diseased and damaged cartilage and bone in the knee and replaces it with a prosthesis, or implant. The lower part of the implant is inserted (rather forcefully!) into the tibia. The upper part is cemented to the femur. 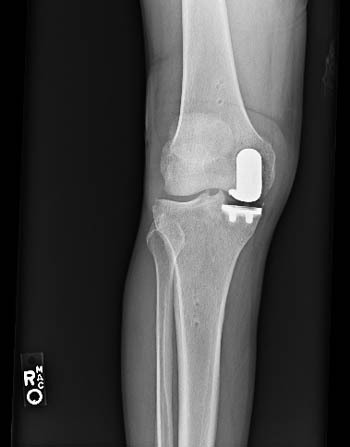 Some folks need a third small implant behind the patella if it is badly damaged. Remaining bone eventually grows around the pieces of the implant and helps hold them in place. You can find a lot of good information about total knee replacements on the internet with a simple search of the topic. Choose websites that are the most likely to be reputable, like the American Academy of Orthopaedic Surgeons or the Mayo Clinic. You can also find hundreds of videos on the internet that show all the gory details of both partial and total knee replacement surgeries. Jim watched several of them before his surgery last winter. I still -- five weeks after my first knee replacement -- have not watched any of those videos nor do I intend to do so before my second knee replacement. It's graphic enough to see pictures like these and my own X-rays. I don't need to see the medical team cutting my knee open or hear them hammering the tibial component into my bone! Knee replacement surgeries have become rather commonplace in this country as techniques and replacement materials have improved in recent years, more surgeons have more practice, and more Gen Xers, Baby Boomers, and members of The Greatest Generation have worn out their knees due to aging, lifestyle (including athletic injuries and overuse), and the obesity epidemic. Over 700,000 knee replacements were performed in this country in 2016. It's almost become "fashionable" to say you've had one! The surgery has a high success rate. Every surgery has risks but the risks of infection, blood clots, or something else going wrong during and after total or partial knee surgery are low if patients and medical personnel follow all the recommended procedures. Dr. Schmidt is very concerned about positive outcomes so he has some strict pre- and post-operative "rules" for his patients to follow. The hardest one I've had to overcome is his requirement that I wait at least three months before having my second knee done, even though my recovery from the first surgery has been faster than average for a 68�-year-old woman. I'd have it done tomorrow if he'd do it. One reason I'm glad I was able to wait as long as I have for knee replacements is the average life span of the prosthesis -- anywhere from 10 to 20 years, depending on level of activity and other factors. Reportedly 90-95% of knee replacements last 15 years. The older a person gets, the harder surgery is, so I hope my new knees last even longer than that. With all the medical and scientific advancements in knee replacements I'm surprised implants don't last longer by now. Activities that involve pounding, like running, only shorten the lifespan of a knee replacement. As important as ultra-distance running was to me for 30 years, I will never run again. I won't even walk ultra-marathon distances again, either. And that's OK. I've already proven to myself that I can run and walk distances most people don't even like to drive. I'd rather walk, hike, cycle, and kayak more conservatively from now on and still be mobile in my 90s. I didn't see Dr. Schmidt again after my initial appointment for cortisone and advice until the morning of surgery, three-and-a-half months later. That was OK because he has an excellent medical team with a nurse, two PAs, a surgery scheduler who arranged several other appointments for me, and a "care coordinator." They were able to answer all my questions and gave me lots of information. 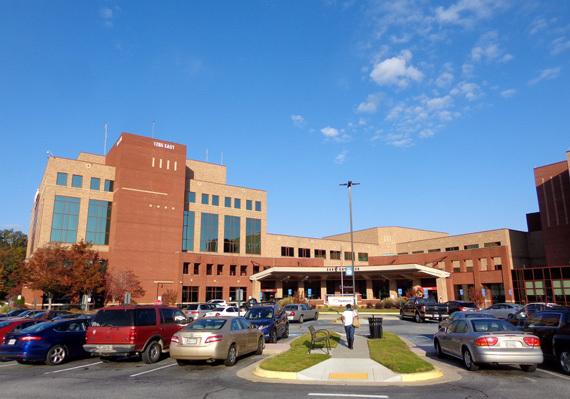 The hospital (Piedmont Fayette) also has a team approach with surgery staff, nurses, nurse assistants, physical therapists, and the department coordinator who teaches the required "joint class" for hip and knee patients. 2. Pre-op appointment with one of Dr. Schmidt's PAs. X-rays were taken of both knees/legs. The PA asked a lot of medical questions, answered my questions (I had a long list), and gave me more information about what I needed to do prior to surgery, like what meds and supplements to stop taking and when. I signed consent forms and got scripts for post-surgery pain meds. 3. "Joint class" at the hospital three days before surgery. This was similar to the class I attended at the hospital in Brunswick with Jim. It's a pre-operative education class so patients and their "coaches" (the person who will be with them after surgery) know what to expect before, during, and after surgery. I was required to go to Jim's class but he didn't have to go to class with me here. That's fine, because I could tell him what differences there would be between the two hospitals' procedures. 4. Pre-admission testing at the hospital right after the joint class, which was a thorough review of my medical history and current vitals (blood pressure, temperature, oxygen level, pulse). Another one of my neighbors was the nurse supervisor for the orthopedic wing at Piedmont Fayette Hospital for many years. She's retired now but told me to mention her name to the staff while I was there. The pre-admission nurse, joint class nurse, and nurses who took care of me overnight in the hospital after surgery all know and like her. Having that connection, and knowing this is a nationally top-ranked hospital, also helped alleviate most of my concerns about having surgery. From the surgeon to the hospital staff, I assumed I was going to be in good hands. We got plenty of information well before surgery about how to prepare ourselves and our house for the recovery phase. Since I have a spouse to take care of me after surgery and don't live alone, I knew I'd be recovering at home after surgery and wouldn't have to go to a rehabilitation facility or have professional in-home nursing care the first two or three weeks. We also knew most of Dr. Schmidt's patients go home the day after surgery. That's one of the nice things about his extra-minimally-invasive technique -- usually only one night required in the hospital. Prior to surgery I had a lengthy phone conversation with my "care coordinator" at Ortho Atlanta to be sure everything was in place when I got home. Some of her questions specifically dealt with mobility issues after surgery -- do I already have a walker and cane? do we have steps? are there throw rugs that might trip me up? how easy is it to get into and out of our car? do we have any pets? That was the only real obstacle I presented. I told her about all of our "dogs on the floor" (see last journal entry about our three Labrador retrievers) but assured her Jim and I had already discussed that issue pretty thoroughly so I would be at low risk of falling. Can I help it if I'm the Pied Piper? They like to follow me wherever I go. 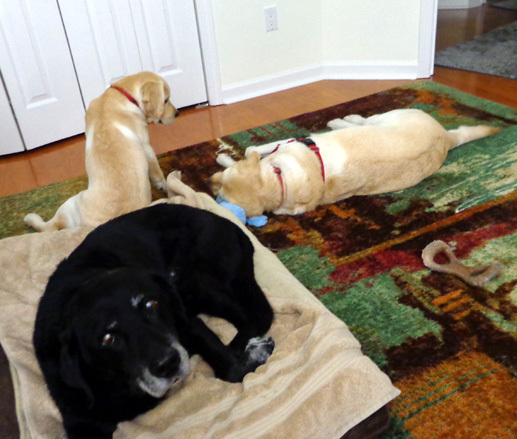 Since Jim would need to be at the hospital most of the day of surgery, we arranged doggie day care and possibly overnight boarding for Casey (5-year-old Lab) and Holly (just 16 weeks old, but had completed all her shots that week). We had time to get them to day care before I checked in at the hospital and Jim was able to retrieve them later in the afternoon so they didn't have to stay overnight. They went back to day care the next day when Jim came back to the hospital for three hours. I didn't know if I'd be able to stand up very long to prepare meals the first few days at home so we went on a cooking frenzy prior to surgery. We made six of our favorite dinners with four servings (or more) in each = a lot of meals. We froze them to make it easier on both of us the first couple of weeks. Turned out, we made more than we needed. I would have been able to prepare meals just fine the second week but it was nice having them already made. I have several loose-fitting athletic and lounge pants so I didn't need to purchase any more clothes to fit over my swollen, bandaged knee. The weather was warm enough to wear shorts anyway. I didn't need any new shoes, either. Most of the time since surgery I've been wearing two different pairs of Keen athletic sandals rather than running shoes. The sandals are easy to get on, accommodate a swollen foot, and are comfortable enough to walk or cycle on the paved bike paths in our neighborhood.